The charred land pictured Monday, June 11, at the gun range where the Bocco Fire started Saturday, June 9, in Wolcott. The road leading to the gun range opened at 1 p.m.
• The smoke visible throughout much of Eagle County is originating from fires outside of the county. Please do not call 911 to report unconfirmed smoke reports as new fires. • The air quality may change depending on your location, time of day, winds, etc. • If smoke is thick or becomes thick in your neighborhood, you may want to remain indoors with windows closed, if possible. This is especially important for young children, older adults and those with chronic health conditions such as heart disease or respiratory illness. • All persons should consider limiting outdoor activities when moderate to heavy smoke is present. In general, if visibility is less than five miles in your neighborhood due to smoke, air quality has reached a level that is unhealthy. WOLCOTT — Crews fought a Vail Valley wildfire to a standstill, despite high winds and dry conditions. 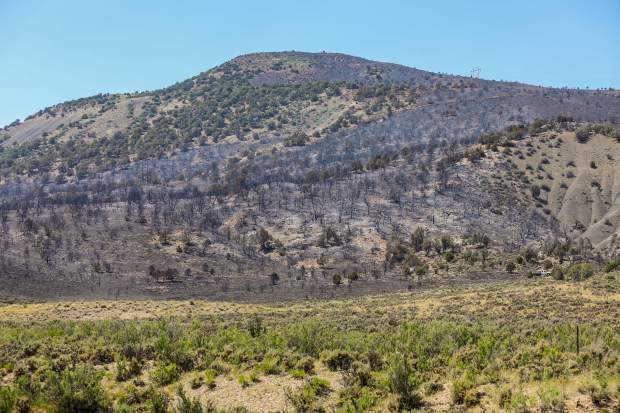 The Bocco fire three miles north of Wolcott was still 415 acres Monday, June 11, the same size it reached Saturday afternoon, June 9, a few hours after it was sparked near the Wolcott shooting range. Evacuations were lifted Monday afternoon. Containment reached 50 percent; 140 firefighters are on the scene, the Bureau of Land Management said. On Monday, the fire began to burn back on itself toward existing containment lines on the north edge of the fire. Crews continued mopping up and extinguishing hot spots along the south and west edges of the existing perimeter. Conditions remain dry, hot and breezy. State Highway 131 was opened. However, fire operations continue, and cyclists with the Ride the Rockies bike ride are in the area. Motorists are urged to be cautious in the area, Spetter said. Ground and air crews were hard at work getting a jump on the fire within minutes after local backcountry guides from Mountain Wolf Jeep Adventures and Sage Outdoor Adventures reported smoke Saturday afternoon. However, on Sunday air operations had to be suspended because someone was flying a drone in the area of the fire, Spetter said. “If you fly, we can’t,” Spetter said. Crews from the Vail Fire Department and Eagle River Fire Protection District quickly jumped on a small fire in East Vail on Monday and kept it small — less than an acre on U.S. Forest Service land, said Aaron Mayville, with the U.S. Forest Service Holy Cross Ranger District. A campfire escaped a ring in the East Vail campgrounds and sparked the fire. Vail firefighters were on it in minutes from their East Vail station, joined quickly by Vail firefighters from the other two stations. Mayville urged everyone to be careful out there. “Please be responsible, careful and respectful,” he said. Without significant moisture to our area, the Eagle County Sheriff’s Office said Monday to anticipate fire restrictions in the next few weeks. “Currently, some areas of Eagle County are significantly drier than others. We are asking everyone to use caution and common sense even without restrictions. Smoke inside or in a cleared area, small fires only in fire rings, extinguish all fires completely, never leave a fire unattended, and no fireworks,” Jesse Porter, Sheriff’s Office public information officer said.